A pair of killdeers have made their nest in the Polk State Winter Haven Administration Building parking lot. 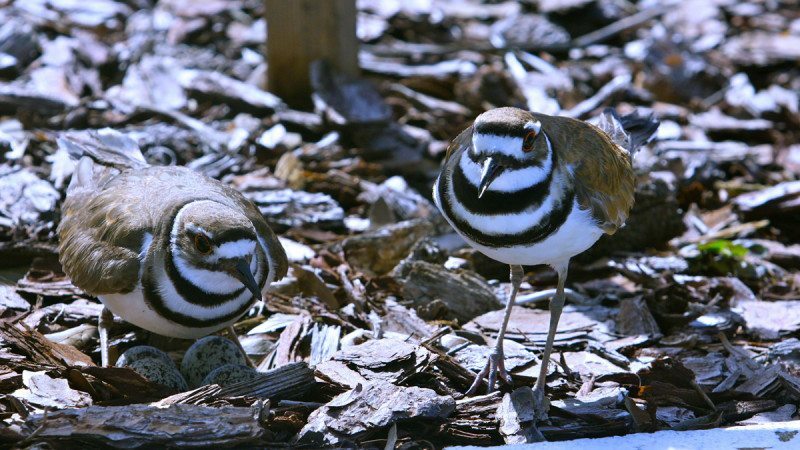 The Eagle will always be Polk State’s favorite bird, but as the story of two killdeers proves, the College is a place where all feathered creatures will find a safe home. 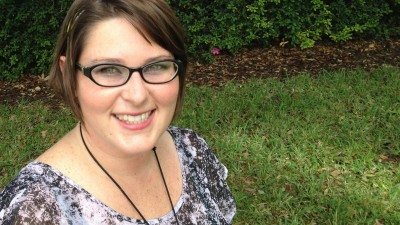 In mid-May, Sports Information Coordinator Lisa Coffey was walking by a small, mulched island in the middle of the Polk State Winter Haven Administration parking lot when she heard what she described as a loud squawk. “I heard a squawk and then I looked up into the sky, but I didn’t see anything. Then I took another step and heard it again. I looked down and saw a bird sitting on the ground,” she said. Coffey immediately asked her Office of Communications and Public Affairs colleague and fellow animal lover Leah Bartholomay to inspect the situation. Bartholomay has rescued numerous animals in the four years she has worked as a designer at the College, and has developed a reputation as the go-to person for help with injured birds, squirrels — even bats. “I did rescue a fruit bat not too long ago. It was in the middle of a walkway near WLR and I picked him up, wrapped him in my bathing suit, and took him to one of the bat houses on campus,” she said. “I’ve always been an animal-lover. I get it from my dad,” she said, adding that while living in Connecticut, she once saved a family of opossums. She also once saved a hawk, which she allowed to sleep in her bed while she was nursing it back to health. When she joined Coffey in the parking lot, two things were immediately apparent to Bartholomay: One, the birds were killdeers, a species that gets its name from its shrill call that sounds like the words “kill-deer,” and two, the birds had chosen a particularly precarious spot to nest. Killdeers make their nests in shallow depressions that they scratch into the bare ground. Once they lay eggs, they add rocks and sticks on top of the eggs. The Polk State killdeers, however, had chosen to nest just inches from a parking spot. Bartholomay was afraid that the eggs would be harmed — no matter what the adult birds may have used to conceal their soon-to-hatch young. “My concern was that they might get crushed or that people would bother them,” she said. At the time, the mating pair had just one egg, in the days that followed, more eggs appeared in the nest; there are now four waiting to hatch. Knowing something had to be done to protect the nest, Bartholomay enlisted the help of Maintenance Specialist Lieson Wallace. Wallace, known for singing while he traverses the campus in his golf cart, wasted no time coming to the birds’ assistance, creating a barricade of tall stakes and caution tape. “These birds are a part of creation. It’s important that we take care of them and all animals,” said Wallace, whose typical job duties include fixing broken water fountains or running toilets. Bartholomay, using her design skills, created a yard sign printed with information about the killdeers. Someone — neither Wallace or Bartholomay knows who — used an overturned recycling bin to block off the parking spot immediately adjacent to the nest. Both Wallace and Bartholomay regularly check on the nest, and it’s not unusual to see others pausing to read the sign and check out the expectant parents. The killdeer are known for feigning a broken wing to draw the attention of predators away from their nests, a fact Wallace only recently learned, but one that he finds immensely inspiring. Bartholomay hopes others, like Wallace, will learn and be inspired by the nest in their midst. “I hope people become more aware of nature, and how man has really taken over the world,” she said. Based on her research and the date on which the nest was discovered, Bartholomay expects the eggs will hatch in the coming week. When they do, Bartholomay and Wallace say they won’t be far away — ready and willing to protect the hatchlings in any way they can, just like they’ve done since the first egg appeared in, of all places, the parking lot. “As human beings, it’s important that we take care of these creatures. They needed us,” Wallace said.